Discover the vibrant culture and natural beauty of Southern California when you stay at Manchester Grand Hyatt San Diego. 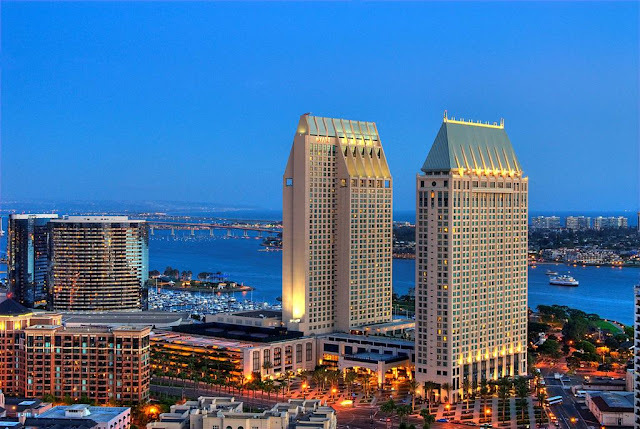 This convenient hotel near downtown San Diego offers a spectacular waterfront resort-like setting, complete with shopping, dining, and entertainment venues. Large outdoor sundecks and 2 spa tubs complement the Manchester Grand's 2 outdoor pools, while spa services, such as massages and facials, complement the 24-hour fitness center. Manchester Grand Hyatt San Diego guestrooms have floor-to-ceiling windows with expansive city or partial-bay views, large desks, free bottled water, 55-inch flat-screen TVs, free wireless high-speed Internet access, and free local and long-distance calls.